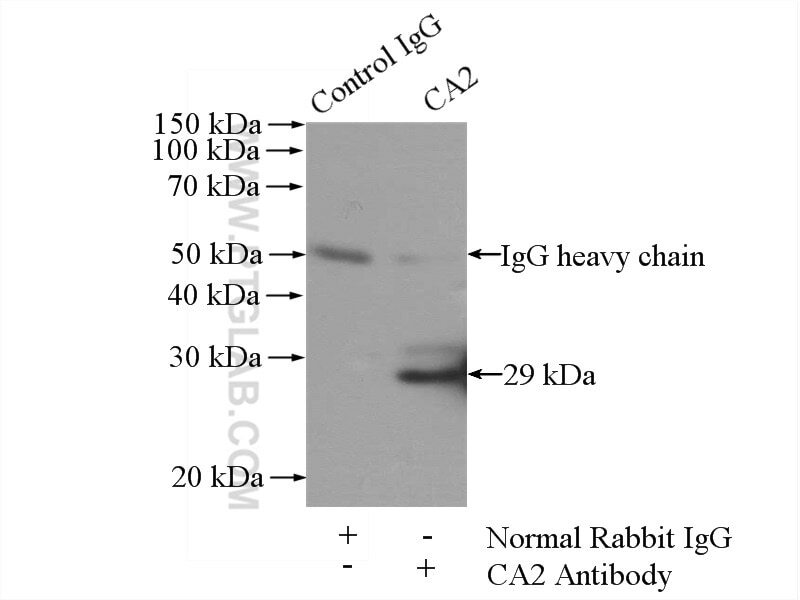 IP Result of anti-CA2 (IP:16961-1-AP, 4ug; Detection:16961-1-AP 1:500) with mouse kidney tissue lysate 4000ug. CA2(carbonic anhydrase II ) is also named as Car2, CA-II, CAII and belongs to the alpha-carbonic anhydrase family. It reversibly hydrates CO2 in cellular ion transport and homeostasis. CA2 is essential for bone resorption and osteoclast differentiation. It regulates SLC9A1 activity via a phosphorylation-regulated CAII binding site in SLC9A1 tail(PMID:16475831). It also may be involved in the development of brain(PMID:16825953). Defects in CA2 are the cause of osteopetrosis autosomal recessive type 3 (OPTB3). Quantitative protein and mRNA profiling shows selective post-transcriptional control of protein expression by vasopressin in kidney cells. Essential role of carbonic anhydrase XII in secretory glands fluid and HCO3-Secretion revealed by disease causing human mutation. SWATH-based proteomics identified carbonic anhydrase 2 as a potential diagnosis biomarker for nasopharyngeal carcinoma.